Long tubes in, finished parts out. One system - one process. We do more than just build machines. As a full-service Machine Tool provider, we also design and build your automation system. 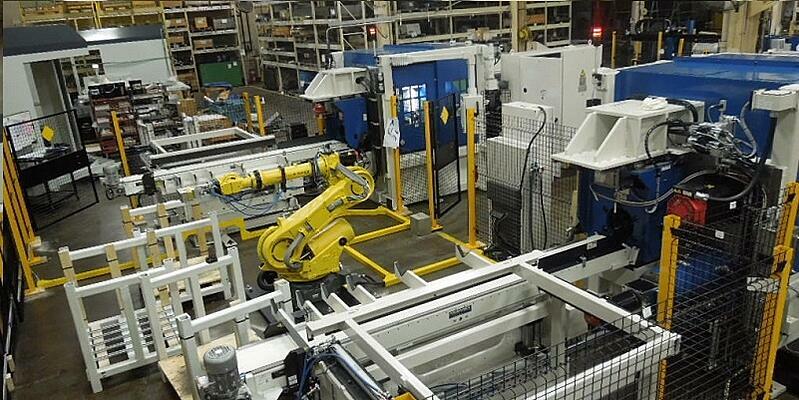 Our robotic and industrial automation systems are integrated with our engineered solutions. All are designed for efficiency and repeatability within all aspects of the production cycle. Our engineers and technicians work with you from the very first conversation. We design with you to meet the most demanding challenges of your unique application. We become part of your manufacturing process as we identify process improvements, equipment enhancements and opportunities to streamline operations. Our automation solutions go beyond machines and robots, as we similarly build material handling solutions such as loaders and unloaders for your complete cell. Designing and deploying the latest automation systems can save you time and overhead costs by optimizing your machine performance and process. Additionally, we provide the in-house engineering expertise to support the installation by training your operators and assemblers and offering the ongoing technical support you need. Whether designing a factory of the future to meet strict production and SPC requirements, a simple pick and place system to handle a few thousand parts each shift or a large-capacity system for heavy lifting, Bardons & Oliver should be part of your development team. Bardons & Oliver sees the big system automation picture. Our engineers and skilled technicians design, test, install and support automation systems that increase efficiency and optimize your process.